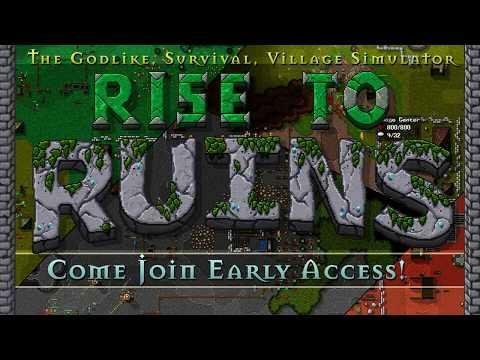 Rise to Ruins [itch.io, Steam, Official Site] is a personal favourite of mine, a godlike village simulator that's regularly updated and it's getting better all the time. The latest development updates are big and introduce a new furry race. The "InDev 29" update introduces The Catjeet, a new mob that's a bit like your villagers, with more dexterity, less strength, fur and a tail. In addition, you can now build a marketplace, which will attract the Catjeet. You will be able to buy and sell resources from them and they can even end up as a permanent part of your village. The Small Farm has also been removed, instead, you can now upgrade a farm twice, starting with 6 crop tiles, then 9, and finally 13. Also, the game now features Loot Boxes. Although, they're not the traditional kind. They're hidden throughout the map and they require keys to open, which are also hidden throughout the map. You can also buy Loot Boxes from the new Catjeet mob. As usual, there's also plenty of bug fixes and optimizations resulting in a smoother experience overall. You can see the changelog here. Even though the game is not finished, it's well worth checking out. An anthropomorphic catlike race who act as traders? That's the most original idea I've ever seen! Kels An anthropomorphic catlike race who act as traders? That's the most original idea I've ever seen! Great to see another creative update to my favourite village building sim. Yet another developer who is not falling for micro-transactions. An Ork who is a good smith ? A Crimsonguard who is dark skinned and good at fighting ? A TallElf who is good at magick ? Joking aside , I have the game , and I am glad they are working on it and not giving in to micromania. razing32 An Ork who is a good smith ? Little fun fact: Ork is the German translation of Orc. So what do you guys call the Orks in the Warhammer 40k franchise ? The "k" is the only thing setting them apart from their medieval-fantasy cousins. That and being fungus based hybrids and all. razing32 So what do you guys call the Orks in the Warhammer 40k franchise ? AFAIK they are both written with a 'k' in the German versions. Das ist nicht richtig. Wir haben regeln fur alles worte im Deutsch.